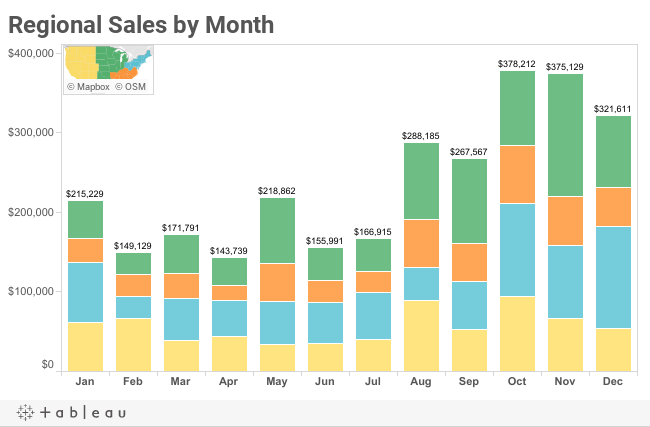 Editor's Note: It's Design Month at Tableau Public and we are thrilled to have this guest blog post from our Iron Viz Champion: John Mathis. John is a Information Management & Analytics Consultant at Slalom and blogs as The Datographer. How complex was your last dashboard? I’ve seen many dashboards crammed full of every potentially useful piece of information. The result bombards users with an overwhelming array of different charts, graphs and tables. This forces users to evaluate all of these competing components to determine which one to focus on when they open the dashboard. Recent research into ‘Decision Fatigue’ suggests that the more decisions you make throughout the day, even simple ones, the harder each subsequent decision becomes. By avoiding unnecessary decisions, you free up brainpower for decisions that really matter. In fact, this research was recently cited by Mark Zuckerberg when he was asked why he always wears the same gray tee shirt and black hoodie everyday - one less decision. Turning back towards dashboard design, let’s see if we can’t help our users make one less decision. Should I continue reading this blog post? Let’s make that decision easy… yes! Let’s break down how this dashboard serves up ‘information on demand’. The paramount focus is on sales performance over time. A time series bar chart conveys this information in such a familiar and intuitive fashion that users don’t have to do a whole lot of thinking right off the bat. Total monthly sales (critical figures for the executive) are displayed when loaded. The secondary focus is on regional performance. Colors easily distinguish between the different regions to highlight variances. The regional detail only displays labels when highlighted to avoid crowding the viz with an additional 48 values (4 regions x 12 months). These values are only displayed when the users needs then. The final trick is including information which is not encoded in the visualization itself and is available via tool tip when the user digs deeper. In this example, I include the top customer for each region/month and what percent of sales they represented. This provides essential context when looking at the variability of regional sales. We can see East region sales dropped by over 60% from Jan into Feb. However with a simple hover, I can see in January the top customer (Dana) accounted for a third of all the sales. A technical note on how this was accomplished. I used a table calculation (TOTAL) to total sales for a region/month. I then sorted customers descending by sales and kept only the first record of the partition. The result is I have both the total sales for that partition (overall region sales) and taking SUM([Sales]) returns the sales for that top customer. Although each trick is subtle, the cumulative effect is a simple, powerful visualization that has depth. Different flavors of these tricks can be used based on your business needs, but the concepts remain the same. The next time you are building a dashboard, challenge yourself to see if any information can be taken off the initial screen and provided ‘on demand’. A very nice article, which highlights many of the topics I challenge both myself and my team with as we design our reports and dashboards. It all sounds simple (i.e. "what do I need to show here? "), but answering that question requires that you understand what is most critical for the situation at hand. And sometimes your audience doesn't know what that is (which means they can't just tell you), but they'll recognize it when they see it. 1) While your view showed the monthly sales for the selected region, the stacked bar chart doesn't allow you to actually see a trend (other than for the bottom slice). So I added a simple line chart that not only shows the trend for the selected region, but highlights the month the user clicked on to emphasize where that month falls on the trend line. 2) Knowing who the top customer is by month (and how much of the total sales they accounted for) is useful information, but the context is missing, i.e. how many customers were there, by how much did the top customer out-perform the next several customers, etc?). So I added a ranked customer chart for the selected region and month, which answers those questions. I'd be interested to know if you think these changes enhances or muddies the view.